But now we know why UFO didn’t make it: It was too far ahead of its time. UFO was produced by Gerry and Silvia Anderson, the group who brought the world various Supermarionation (hi-tech puppets) programs like Thunderbirds, Captain Scarlet and Fireball XL5, and later, the live-action Space:1999. Set in 1980, and replete with well-designed sets and mod styles (big hair, long sideburns and lots of leg), UFO presented the daily routine of a para-military organization in its struggle to prevent aliens from establishing a beachhead on Earth to (what else?) steal our organs for their own survival. The aliens were clever, but we had dogged and relentless determination and good-old international know-how on our side, and destroyed or drove them back every time. 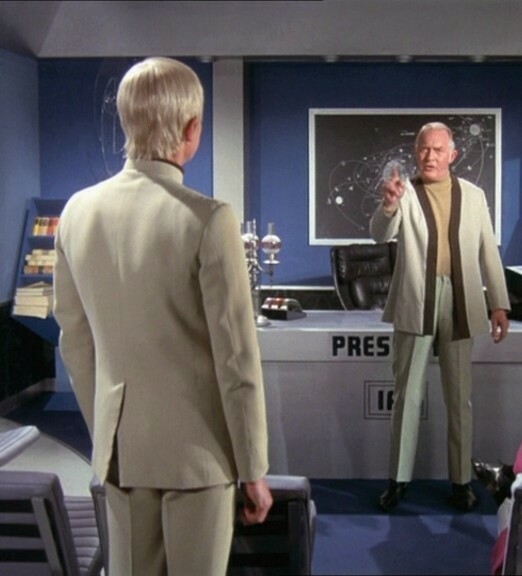 UFO was unique among SF shows, in that the main theme was really more of a backdrop for the real theme of the show: The people, the relationships, the troubles of the officers of SHADO (Supreme Headquarters, Alien Defense Organization – geeky Steve) as they dealt with their daily lives. And those “daily lives” involved dealing with lovers and ex-wives, relationships with those inside and out of the organization, job pressures, security, keeping secrets about your work, racism, sexism, drugs, paranoia and personal foibles that sometimes impacted on how well you did your job. Yes, all of those were major elements of various episodes. An SF show that’s mainly about people and their personal problems. Sound familiar? Does Lost ring a bell? How about Galactica? Science fiction has been growing up, and the childish fascination for explosions and flashy effects is being replaced by the more adult concerns of family, friends, social groups, responsibilities and our place in our world. Yeah, yeah, there’s an alien coming… but my son just got hit by a car, and I need to get medicine to him! (Yes, that was a UFO episode.) I can’t tell anyone about the alien I just killed… because then they’d know I was here having an affair! (Yup… another one.) I don’t want people to think I made a decision on who should die based on my personal feelings about a Black pilot I like. (You got it.) I know you need a new Moon buggy, but there’s nothing left in the budget! (You get the picture.) These were stories about people with problems viewers could relate to, resulting in its being labeled as “too soap-opera-ish” at the time. Yet, UFO was broaching such subjects when other shows were busy trying to figure out which powdered bits of metal would make the next space explosion look cooler. I’ve recently heard people lament the past innocence of SF shows like Star Trek; the simplicity, the barely-factual science, the cliff-hanger last-minute solutions, etc. They long for the simple sci-fi of yesteryear, the equivalent of going out into your backyard and playing “army men” in the grass (or, in this case, “space men”in the dirt). In fact, the science of UFO was simple (and, hell, much of it unworkable). But it really didn’t matter, any more than the mechanics of “jumping” through space mattered to the central theme of Galactica; namely, what it means to be Human. UFO was in the same place, dealing with the same issues. But it was doing it 40 years ago. If you’ve never seen UFO, try to check it out… it’s available on DVD. If you do see it, maybe you’ll have the same realization I had: These guys were way ahead of the curve. Previous Previous post: Solar Decathalon: Is the future of American housing in here?